That brand new stove is calling your name. You head outside, connect the propane tank, fire up the burners—and nothing but a tiny flame lights up. Sound familiar? Why Does Low Flame Happen? 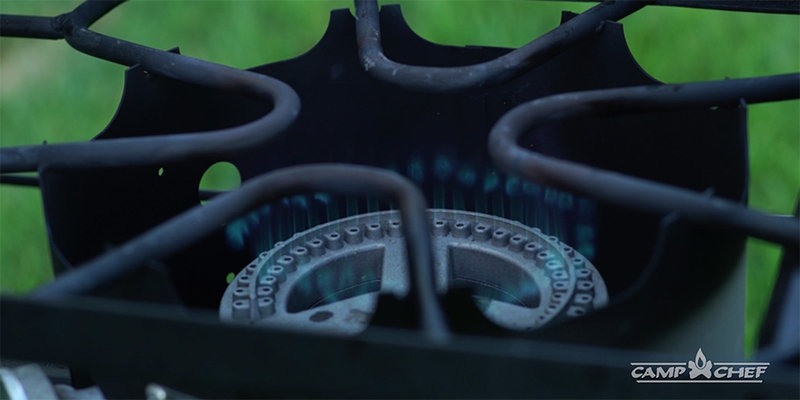 Low flame issues are common with any kind of propane stove or grill because of the safety mechanism in each regulator. Regulators are designed with a special mechanism to limit gas flow in the event of a leak. Here’s the idea. If your gas appliance had a leak you didn’t know about, and you turned on the propane tank, fuel would be leaked into the air next to a stove with an open flame. Can you spell “bad news”? With its safety mechanism, the regulator can instead detect an excess flow of propane and reduce it. What you’re left with is a “low flow” of propane through the hose and a weak flame. Crisis averted. How Do You Fix Low Flame? Safety is important, of course. But you’d rather be grilling brats and burgers instead of staring at cold burners. Lucky for you, and everyone waiting for dinner, this problem is easy to fix. • First, turn off your stove or grill burners and close the propane tank. Make sure everything is in the off position before you disconnect the regulator. • Disconnect the regulator from the tank and let it sit for several seconds. This time allows the regulator to reset. • Reattach the regulator to the tank, and perform a leak test as described in the instruction manual. Brush a 50/50 soap and water solution over the hose and each connection point. That includes the point where the regulator meets the tank, where the hose meets the stove, where the valves attach to the manifold, and the length of the manifold itself. • Slowly open the tank valve, giving it ahalf turn to start. If you hear a rushing sound or see “growing” bubbles anywhere you’ve applied the soapy water, turn everything off. You have a leak. To fix it, try tightening the connections or order a new part. Don’t use your appliance until you’ve repaired the leak or replaced the faulty equipment. • If you didn’t notice any leaks, you can now try lighting the stove. Ignite the burners and adjust the heat-control knobs to test. • If the flame looks normal, you’re ready to grill, bake, fry, or boil. What If It Still Doesn’t Work? If our suggestions above didn’t work, you can check for these other issues. • Clean out the burners and venturi tubes (burner stems) to clear any dust, dirt, or spider webs. These kinds of blockages may lead to a low or yellow flame. You can use a garden hose or air compressor to spray straight down into the burners; likewise, you can spray into the venturi tubes. If you use water, lay the stove upside down for about an hour before using again to let the water drain out. • Make sure the valve orifices are clear of dust and dirt as well by removing them from the venturi tubes and checking. If necessary, clean them with a small wire. • Test your stove with a different propane tank. You might just be running low on fuel. • Test your stove with a different hose and regulator. Be sure to perform a leak test on this hose and regulator before lighting the stove. If none of these solves the low flame on your gas grill or stove, feel free to give us a call. Our customer support team members can handle just about anything you throw at them. We’ll get your stove up and running, so you can get back to cooking what you love. I purchased a Camp Chef “Campers Grill/Griddle/Stove Combo” three years ago and from the start it did not produce the heat I expected (so I have never used it since that first camping trip.) The grill was the most disappointing part and the griddle was marginally OK though the single burner was acceptable for some things (frying eggs or making rice) but virtually worthless for pasta etc. I have now gone through all of the steps you have suggested and it still is a wimp! I purchased the stove through Outdoor Cooking and have not complained to them, really I was just going to junk the stove and get another one for our camping outings. My Coleman standby is OK and I do alot of Dutch Oven cooking but I am now shopping for a new two burner – I sort of like a couple of Primus but then I saw your new Mountaineer and love the BTU’s it seems to produce, the aluminum and the look! But it is so new…I would like to see what others say about it before I spend $200+. Any objective feedback on it? Or what might be wrong with the other stove I have? Hi Marc! We’re sorry you were disappointed with your first stove. The Campers Combo has a 10,000 BTU and 8,000 BTU burner, making it great for light cooking jobs but certainly not the most powerful stove we offer. It would be difficult to say what “might be wrong” with your stove without knowing the exact circumstances of your first use. It might just be that you need a little more cooking power for what you want to do.